All sales are final. There are NO returns, exchanges, refunds, or transferred credits on any item sold at d’Anelli Bridal, Special Occasion & Prom. Gowns will be ordered only after the last bridesmaid has been measured and payment has been made. It is your responsibility to follow up with your bridesmaids to make sure they have placed and deposited their order before the deadline date. Gowns take approximately three to four months to arrive in the store. The named contact person, as specified on the original order, will be notified of the arrival of the gowns. 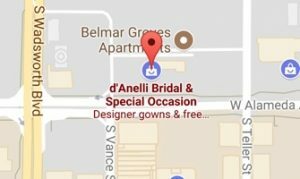 Garments must be inspected by bride or named contact for any manufacturer flaws or discrepancies within seven business days after arriving at d’Anelli. It is the named contact person’s responsibility to contact the bridemaids after the arrival of the gowns. Any balance remaining for the purchase price of the gowns is due when they arrive. Additional charges will be incurred for shipping merchandise from d’Anelli Bridal to a different location. Orders must be paid in full before being shipped from d’Anelli Bridal. Alterations are not included in the price of the gown.